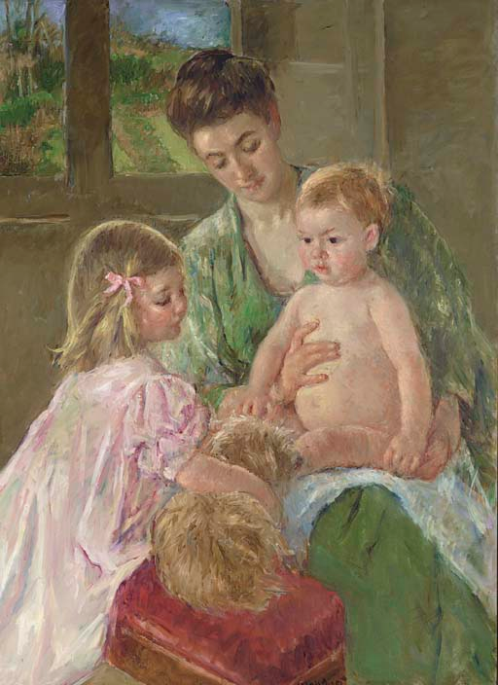 This work exemplifies Cassatt’s unique style that incorporated elements of Impressionism, Realism and her own view of the world. In the latter part of her career, Cassatt almost exclusively painted women and children in scenes depicting everyday life and the love mothers have for their children. It was somewhat common for one of more of the children to be unclothed, but the mothers are never depicted without clothing. Some refer to this series of paintings as the “Modern Madonnas” as they show the almost spiritual connection between a mother and her children. Cassatt manages to extract the beauty of the moment without becoming overly sentimental. Children Playing with a Dog is one of only a few that includes a landscape visible through a window. It, moreso than the overall work, is painted in an Impressionistic style. According to someone who knows more about these things than I do, this work shows the growing maturity in Cassatt’s work. The textures of the dog’s fur contrast with the silken folds of the girl’s skirt and the velvet footstool are differentiated thought different stroke lengths and thickness of paint. Christie’s wrote of this work in far more detail and their “lot notes” can be viewed here…Christie’s. To learn more about this American Impressionist painter and see more of her famous works, please visit our Mary Cassatt biography.